Do you find yourself often saying the unaccountable phrase, "My alarm must not have gone off" or "I must have turned it off in my sleep"? Well, for all of you not-so-early birds who hate alarms, this is the alarm that you are going to love to hate. Unlike other clocks that you can easily hit the snooze button and fall back asleep, the Clocky Alarm Clock makes sure you get out of bed. Made in China. The alarm goes off once, but if you hit snooze Clocky jumps off your nightstand (up to 3 feet) and wheels around your room looking for a place to hide before it sounds the alarm a second time. The snooze time can be set from 0-9 minutes, so if you set it at 0 Clocky runs right away. Nothing like a little hide-and-seek to get you going in the morning. Click here to view a video of clocky in action! takes 4 AAA batteries, not included. moves on wood and carpet. alarm beeps in random pattern. early low battery warning. 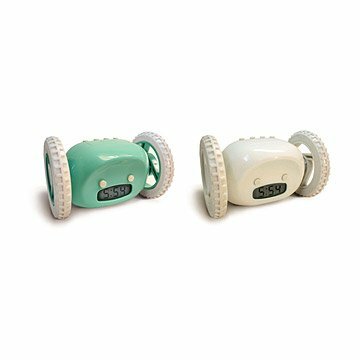 chrome colored clocky alarm clock has been discontinued. When it sells out, it will no longer be available. We apologize for any inconvenience. Wish the volume was adjustable. I got this for my boyfriend who had trouble waking up in the morning. We loved the idea of it and it worked great, but I wish the volume was adjustable. He lives in an apartment and stopped using it because it's so loud it would wake up his entire floor. Getting your neighbours to hate you isn't worth a great alarm clock. If we could lower the volume just a little bit it would've been perfect. My boss NEVER leaves work on time. I felt he needed some help with his time management skills so I decided this holiday to buy him an alarm clock to help remind him it's time to go. When I saw Clocky, I knew this was the clock for him. I created some addition items for Clocky such as calling it the Official Leave Work On Time Alarm Clock and new instructions on how clocky makes you get out of your chair to turn him off and then leave. I can't wait to give it to him next week. I bought this for my husband for his birthday. He LOVED it, and shows it off when we have family and friends stop by our house because it is so funny (a clock that jumps off the nightstand?! Awesome!). The noises are loud enough to wake him up. You won't sleep through the noise because the sounds are so varied you will definitely pay attention and respond. Purchased for my school age son. At first he was psyched to have it. He now enjoys the challenge of running around is bedroom to turn off the alarm, which by the way, is loud enough to wake the house. My 12 year old wanted this alarm clock for Christmas. She is very difficult to awake for school, 5 more minutes please...over and over again. It is unbelievable how well this alarm clock works. It gives her 5 minutes to snooze and then goes into awake mode where it makes all kinds of noises, all anoying and jumps off the night stand and runs around the room. I like this alarm, though my husband freaks out over the noises. Therefore, I don't use it. It won't roll on my longer length carpet either. My girls love it! When we have a better rolling surface, I'll give it to them. A great feature is that the rolling option can be turned off. Finally a way to wake my daughter up so she stays up! The volume is loud enough to wake up the whole household. Love it! Not so sure when she takes it to college how a roommate will feel though. We gave this as a gift. The recipient thought it was hysterically funny, but would never use it. I can't wait until my nephew gets his clocky! It fits his whimsical personality,and because he's a student, he will wake in time to get to classes! Unlike other clocks that you can easily hit the snooze button and fall back asleep, the Clocky Alarm Clock makes sure you get out of bed.